Lightly sweet and beautifully light and fluffy, these Honey Pumpkin Dinner Rolls would be a delicious and beautiful addition to your Thanksgiving table. One of my favourite parts of the Thanksgiving dinner is always the dinner rolls. 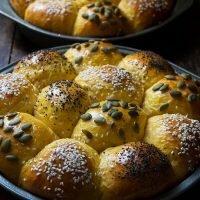 A special dinner demands a special roll and this year, I’m all about these delicious Honey Pumpkin Dinner Rolls. They are perfect for Thanksgiving, as they make a large batch (24 rolls!) and the colour is so festive for the occasion. These Honey Pumpkin Dinner Rolls are also beautifully light in texture and lightly sweet from the honey. The pumpkin lends more in the way of colour, than in flavour, but it’s still a nice background note. 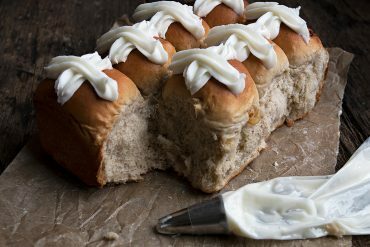 Enjoy these rolls warm with spread of salted butter and it’s a little bit of dinner roll heaven! 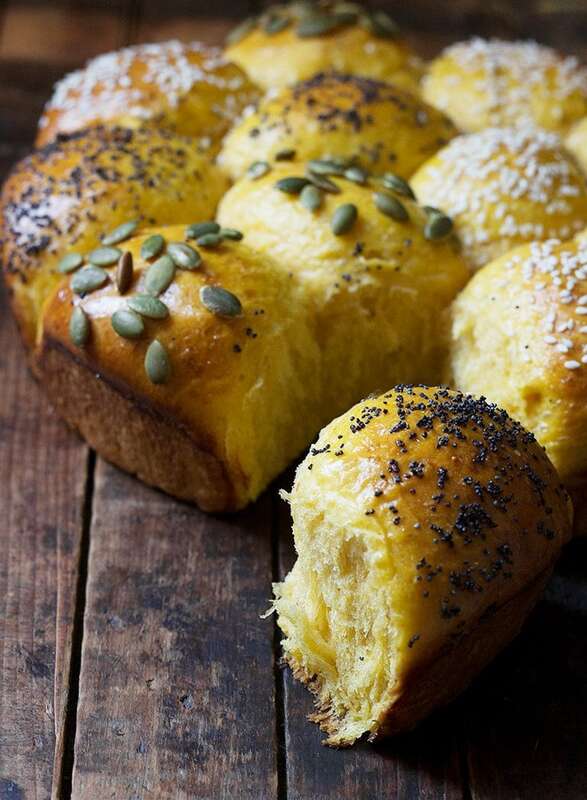 I dressed the top of my rolls in a trio of toppings – sesame seeds, poppy seeds and pumpkin seeds. It makes for a lovely presentation for a Thanksgiving table, but you could certainly use just one or two or none of the toppings. While ripping off a hot from the oven roll is always a temptation, you’ll want to avoid that and let these rolls cool completely, to prevent gummy rolls. This works perfectly for making ahead. To re-warm, simply wrap the round of rolls in aluminum foil and place in a 350F. oven for 8-10 minutes. These baked rolls freeze beautifully, so don’t hesitate to make a week or so ahead, wrap well and freeze. When you’re ready to thaw them, let them thaw on the counter in their freezer wrappings until fully thawed, them re-warm as above, if desired. Change it Up! Substitute any cooked and mashed squash for the pumpkin in this recipe. Butternut or acorn squash would both be great! 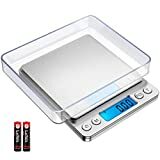 No kitchen scale? 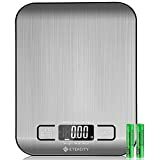 I love my kitchen scale and I wouldn’t be caught baking without it. It’s so handy for so many things in the kitchen. And kitchen scales are so economical, it’s a great investment in better baking! 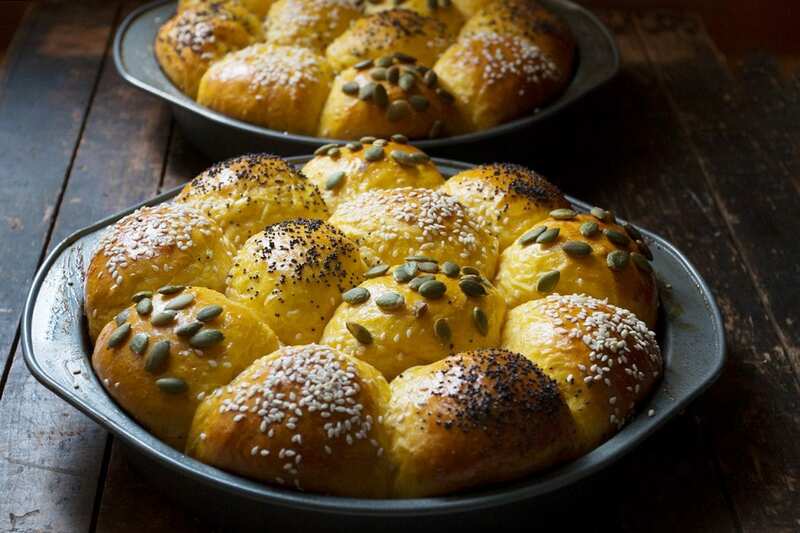 Delicious, light and fluffy dinner rolls, that are lightly sweet and beautifully coloured and moistened by the addition of a bit of pumpkin puree. Makes 24 rolls. Freeze well. In a large bowl or the bowl of a stand mixer fitted with the kneading hook, stir together the yeast, salt, nutmeg and 3 cups of the flour. In a medium saucepan, combine the milk, butter and honey. Heat over medium heat, stirring, until butter is melted and mixture is about 120-130 F. (If it gets too warm, simply stir for a bit until temperature reduces in to this range). Add the milk mixture to the dry ingredients and mix at medium speed for about 2 minutes. Add pumpkin puree and mix for another 2 minutes. Begin adding additional flour, 1/2 cup at a time, to start, and then less as you progress, until you have a moist, smooth but not sticky dough. Turn dough out on to a floured surface and knead a few minutes. Move to a greased bowl, cover with plastic wrap and allow to rise until doubled, about 45 minutes to 1 hour. Meanwhile, grease two 9-inch round cake pans and set aside. *Note: I like to use a kitchen scale to ensure my rolls all come out the same size. It ensures even cooking and it looks nicer in the pan, as well. Simply weigh out the whole piece of dough. Divide that weight by 2 to determine the weight each half should be. To divide each half in to 12 equal pieces, divide the weight of the half by 12 and make all the rolls that weight. One dough has doubled, remove dough to a floured surface and gently deflate. Divide dough in to 2 equal parts, then divide each part in to 12 equal size pieces, for a total of 24 pieces. Form each of the pieces in to a ball. Place 12 rolls in to each pan, with 9 around the outside and 3 in the middle. Cover with a clean tea towel and set aside to rise until doubled, about 45 minutes. Preheat oven to 375F. about 15 minutes before rising is complete. Once rolls have doubled, brush the tops and sides of the dough with the beaten egg, then sprinkle tops with seeds. Doing 4 of each of sesame seed, poppy seed and pumpkin seeds is nice. Place in preheated oven and bake for 22-25 minutes, or until cooked through and lightly golden brown. *Check at the 20 minute mark and loosely cover with aluminum foil if rolls are browned enough at that point. Allow to cool in the pan for 5 minutes, then remove as one piece from the pans to cooling racks to cool completely. Avoid tearing off rolls before the rolls have almost completely cooled to prevent gummy dough. These rolls freeze well, so can be made ahead. Wrap tightly and freeze. Thaw in the same wrapping. Re-heat in a 350F. oven wrapped in foil until warmed, about 8-10 minutes. These are incredible! I found 20 minutes to be plenty for these rolls. Hi Noelle, I haven’t, but I suspect you would get two 8×4 loaves out of the dough. They would probably bake 25-30 minutes. Hope that helps. 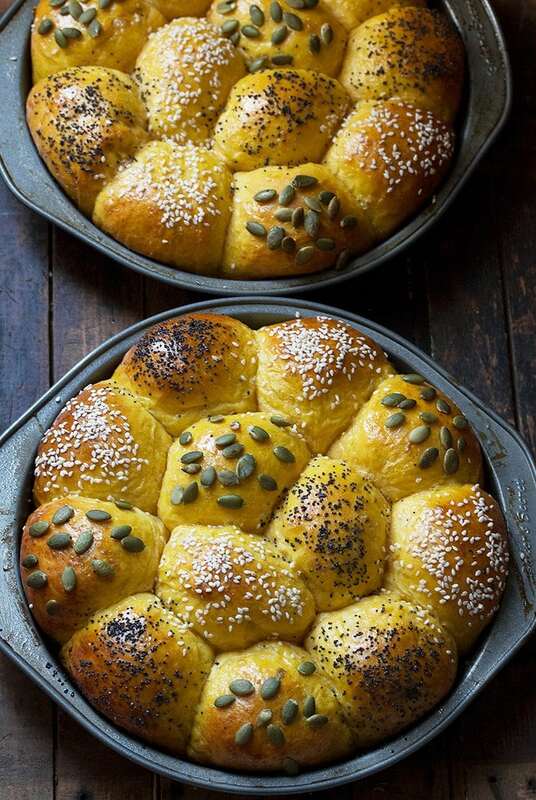 Wondering if you’ve ever baked this rolls as bread loaves? If so, for how long would you personally bake them? Fall is time for dinner rolls and these are beauties! How many ounces of pumpkin do you use? Hi Rebecca, I just measured mine in a measuring cup but if you’d like to weigh you would need 7 oz. I can definitely see an addiction forming here. 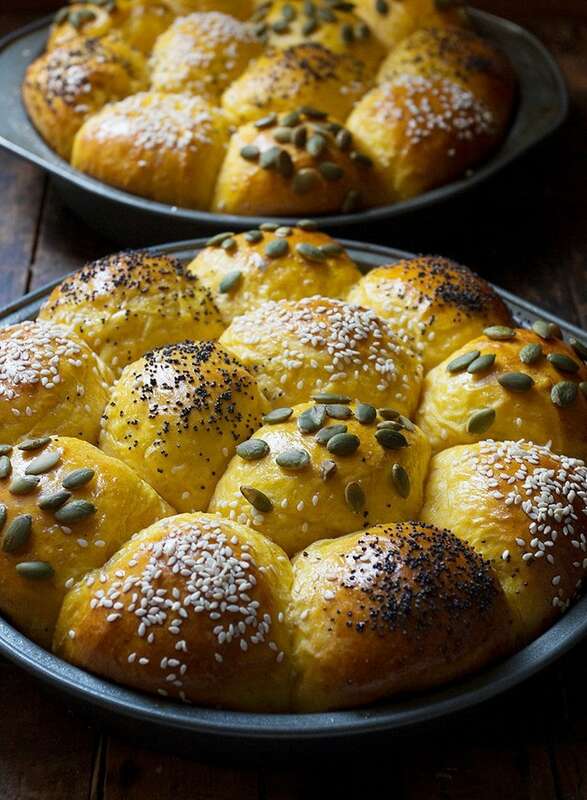 Gorgeous rolls and love the incorporation of pumpkin in them which makes it truly fall. I can’t wait to try these for our Thanksgiving in November. So gorgeous! I am lucky that I cannot smell them right now:) This is definitely a recipe I will try. Just imagining how good my fifth and sixth rolls will taste mopping up gravy from my plate… After having the first four on their own. You’ve been very lucky with the weather! Holy moly! Like, I knew thanksgiving was coming up, but when you say next weekend I am shocked! Where does the time go?! 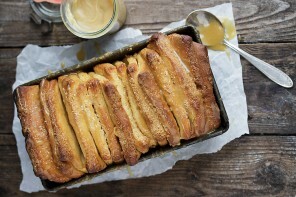 Anywho….these look FABULOUS and they are going to be on my table! 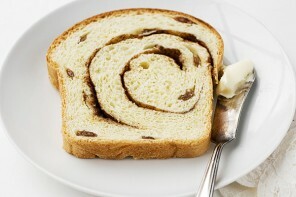 Who needs turkey when there are these rolls slathered in butter :) ! Pinned! Have an awesome weekend, Jennifer! Wow! Thanksgiving already?! These are perfect for the holiday table Jennifer! Bring on the pumpkin! I cannot begin to describe how gorgeous these rolls are Jennifer. You are a master baker! I bet they are so delicious. 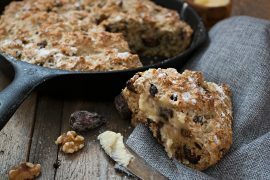 Thanks for sharing this recipe – I have to give them a try! Thanks so much, Tricia :) These were so delicious and can’t wait to enjoy more on Thanksgiving!